Bellinis (sparkling cocktails made with Prosecco and, traditionally, peach puree) and blinis (thin, mini Russian pancakes) don’t just sound alike; they’re also terrific together. Bellinis (sparkling cocktails made with Prosecco and, traditionally, peach puree) and blinis (thin, mini Russian pancakes) don’t just sound alike; they’re also terrific together. Here, ten recipes for blinis and bellinis. Mix and match them for a fun brunch party! Originally made using superseasonal summer blood peaches, this variation on the cocktail combines Campari, grenadine and white peach puree to approximate the rare fruit’s flavor and color. This autumnal version of the brunch-menu mainstay is made with a ginger-infused peach cordial. Jean-Georges Vongerichten adds yuzu juice to his bellinis for a citrusy kick. This variation calls for sour apple liqueur and cranberry juice. Chef Chris Cosentino spikes his bellini with muddled leaves of fresh lemon verbena. Sophie Dahl makes blini with wonderfully earthy buckwheat flour and serves the salmon-topped hors d’oeuvres at parties throughout the year. Chef Bob Spiegel loves to rethink classic combinations, like this architectural take on blini and caviar. 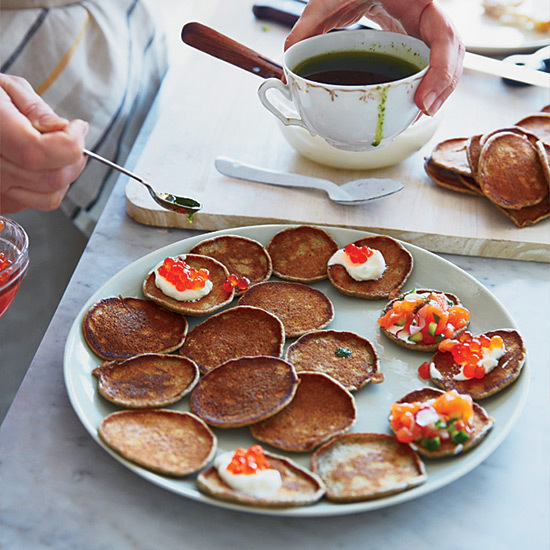 These blini require no rising and come together in just one hour. Serve these herbed blini topped with a combination of crème fraîche and salmon caviar, or with a little dollop of the pesto that flavors them. These exotically flavored blinis are spiked with fennel seeds, caraway, turmeric and crushed red pepper.